BE CAREFUL WITH EACH OF THE FOLLOWING ITEMS-- THE DRUNKEN SEVERED HEAD KNOWS WHAT HE IS TALKING ABOUT! Do not buy the item below and leave it near a bathroom sink. It can be mistaken for a tube of toothpaste, with unfortunate results. Do not eat the wafer below, which comes in an individual cellophane wrapper. It is not a shortbread cookie or freebie from the Girl Scouts. It is a dog treat sample your wife brought home* and left out. These small, sticky, soft brains are not gummi-style candies. They are small, flavorless, plastic TOYS meant to be thrown at walls. They are definitely not meant to be chewed on and then spat out instinctively, hitting a wall. The product below is a gyp. It contains no breakfast snack made from mutant feet. I feel better now that I know TDSH readers are more prepared for some of life's small dangers. * I'm, uh, speaking hypothetically here-- not that I could do anything like eat pet food. Noooo. To apply, just click on the jack-o-lantern icon at the top of the column to the right. 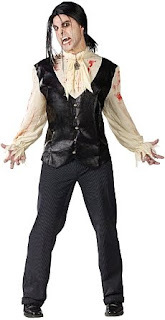 Star Costumes is awarding $1,000 to a student studying to work in the horror film industry. We love horror! We make our living selling scary costumes, makeup and masks, and we owe a lot of our success to the creative output of the horror industry. This scholarship is our way to give back, and to help the horror industry continue to terrify us in the years to come. What great back-to-school noose! I wish there was something like this when *I* was a full-time college student and bodily complete! One of my all-time favorite authors turns 90 today. You can leave a birthday message for Ray here. His works still resonate in memory and imagination for me. This summer I read his From the Dust Returned and enjoyed it very much. I recommend it to you. 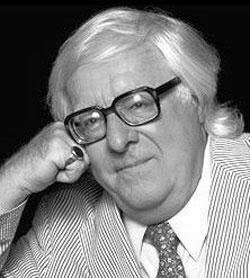 An interview with Bradbury at the site "Wired for Books" can be heard here, and a video interview for Truthdig on "Literature and Love" can be seen here. TDSH--The blog that looks back at you! 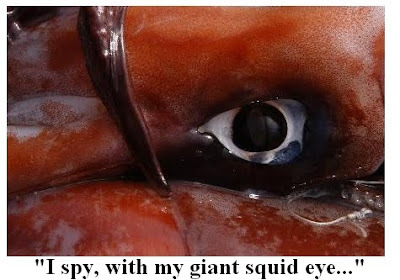 Giant squids have eyes as big as watermelons. A molasses flood killed 21 people and injured 150 people in Boston, Massachusetts on January 15, 1919. In India, A 13-year-old boy urinated out winged beetles after eggs hatched inside his body. In Britain, there are approximately 50,000 pubs with 17,000 different names. Squid eye image source: Post by "Mungus" found at this link. 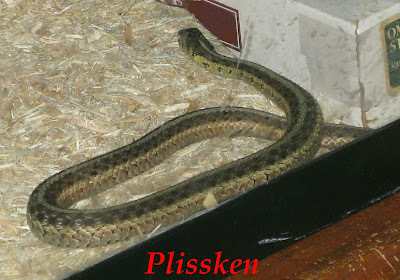 Plissken, our one-eyed snake whose name was chosen from contest entries by Hammer film star Shane Briant, has died of unknown causes. Age at time of death unknown. He will be very much missed by Jane the Voodoo Queen and myself. 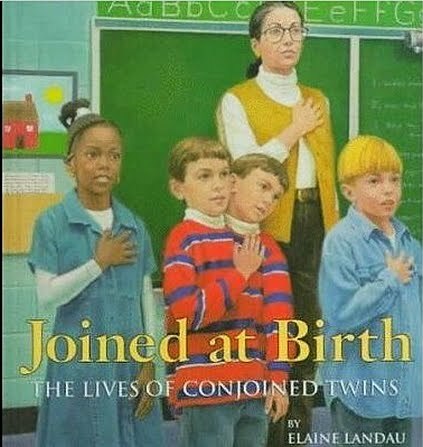 Weirdest Kid's Books of All Time? 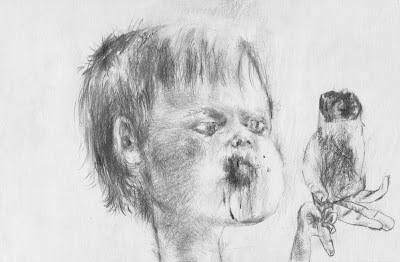 This illustrated, very brief article presents an overview of what author Katla McGlynn calls "The Creepiest Children's Books Ever." But sometimes she cheats a bit-- some are just "gross" titles and some are titles with unintended double entendres. But they're all entertaining. Triskaidekaphobia is an irrational fear of the number thirteen. And today is the only "Friday the 13th" of 2010! So it must be an especially scary day for triskaidekaphobes. Enjoy the fear, my friends! Mwah ha ha ha ha! "Friday the 13th superstitions are rooted in ancient bad-luck associations with the number 13 and the day Friday, said Donald Dossey, a folklore historian and author of Holiday Folklore, Phobias and Fun. "The two unlucky entities ultimately combined to make one super unlucky day. "Dossey traces the fear of the number 13—aka, triskaidekaphobia—to a Norse myth about 12 gods having a dinner party at Valhalla, Norse mythology's heaven. In walked the uninvited 13th guest, the mischievous god Loki. Once there, Loki arranged for Hoder, the blind god of darkness, to shoot Balder the Beautiful, the god of joy and gladness, with a mistletoe-tipped arrow. "'Balder died, and the whole Earth got dark. The whole Earth mourned. It was a bad, unlucky day,' Dossey said. "There is also a biblical reference to the unlucky number 13. Judas, the apostle said to have betrayed Jesus, was the 13th guest to the Last Supper." 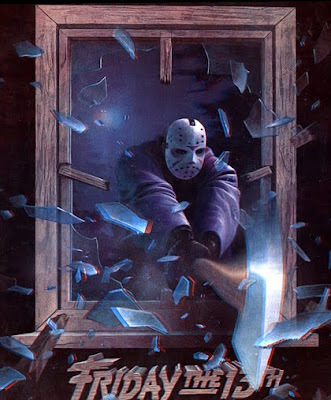 According to howstuffworks.com, the fear of Friday the 13th specifically is known as paraskevidekatriaphobia. Say that thirteen times fast! 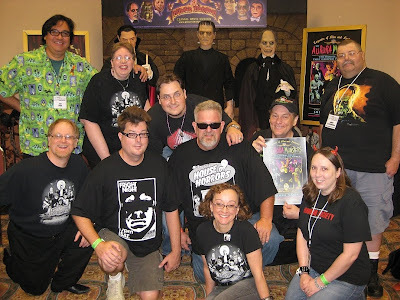 After being delayed for various reasons for too long, TDSH resumes posting the last posts and pics on the Famous Monsters Convention that took place in June. Today I've got an account of one fan's experience of the event, that fan being my internet and convention buddy Dustin Jablonski, another fan of classic monster movies like myself. My deepest thanks to DJ for sending me this. L-R: Noted comic artist Kerry Gammill, fan Dustin Jablonski, Max attached to a dummy's body (No joke, huh? ), FM publisher Phil Kim, and noted illustrator and publisher J. David Spurlock. Like many of us, I grew up reading Famous Monsters of Filmland magazine. My Dad had read it in its heyday in the 1960s. I got my first issue in 1977 (#134) when I was just five years old. I still have this magazine and it is a treasured part of my modest collection. 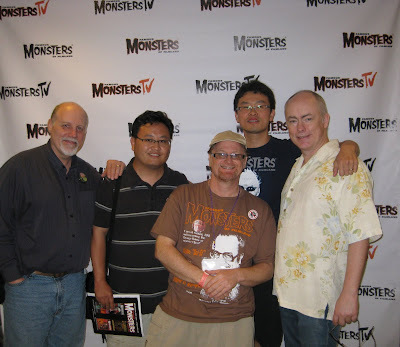 Fast forward to 2010 and I was in the midst of the Famous Monsters of Filmland Convention at the Wyndham Hotel in Indianapolis, IN. I live a mere 30 minutes away so I cleared my calendar immediately to attend and starting tracking all of the latest Con information on Twitter and Facebook. I am definitely one of the more “old-old-old school movie fans” so initially was a little perplexed by the guest list as it seemed to be void of any signs of my favorite “Universal Studios Monsters” personalities/heirs (Sara Karloff, Ron Chaney, Bela Lugosi Jr.). Not long afterward Cortlandt Hull of the classic horror museum The Witches' Dungeon became one of the attractions as well as legendary FM cover artist Basil Gogos. 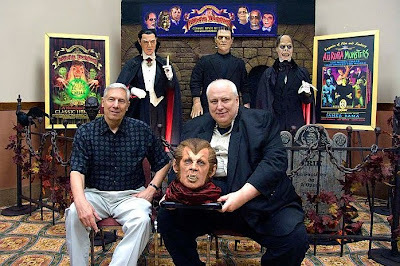 At the very last minute Bela Jr. became a guest of the convention as well as the indispensable film maker Joe Moe, and Forry Ackerman's friend and executor Kevin Burns, the well-known documentary producer (and Munsters expert!). Having Joe and Kevin in attendance confirmed that the spirit of the late editor of the original FM, Forrest J Ackerman, would indeed live on at the convention. Joe was Forry’s best friend who has made it his personal mission to make sure that many of the Ackermonster’s personal belongings remain available for fans to see (Forry’s personal copy of FM #1 and the Amazing Stories magazine that jumped off the noosestand and grabbed his attention back in 1926). Finally the time arrived- Famous Monsters of Filmland invades Indianapolis! 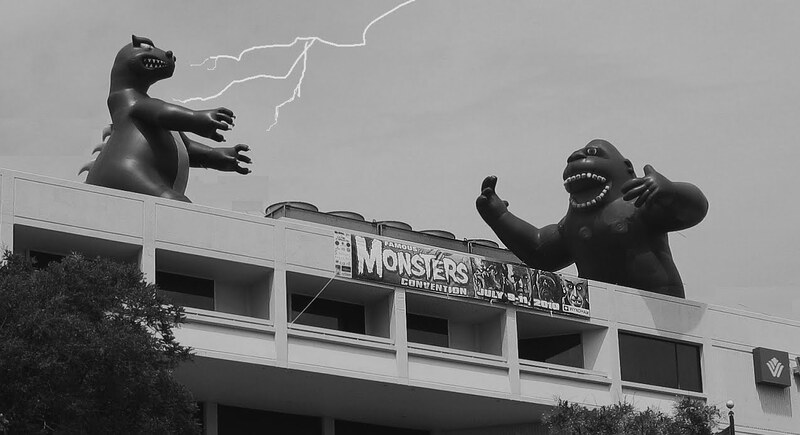 As I pulled up to the Wyndham it occurred to me that I must be at the right place, as I gaze at King Kong and Godzilla up on the roof, welcoming monster fans from around the world. I quickly made my way through the “will call” line at the convention entrance and purchase the con-only "Predator" issue of FM #251 and also the Forry Tribute issue (#250). Organizer Phil Kim sees me and hands me a bundle of programs so I can get souvenirs for friends who could not attend, including Convention program cover artist Frank Dietz. My stack of goodies is already so large that I immediately head out the back door to my car. From looking around at the con I spot Cortlandt Hull with his wonderful collection of life-sized monsters on display. Cortlandt is always fun to talk to and a true movie historian. Above: Various members of the Universal Monster Army. Joe Moe is in the upper left corner and Cortlandt Hull, with cap, holds a poster. After a quick look around the dealer’s room I attend the Famous Monsters/Forry Ackerman Panel. On the way in I run into Ain’t It Cool News website creator and super-fan Harry Knowles. Harry has some wonderful stories about Forry and is nice enough to pose for a picture. The Famous Monsters Panel is enlightening and thankfully is focused more on the panel members sharing memories and stories about Forry. Joe Moe, Bela Lugosi Jr., Kevin Burns, FM owner Phil Kim, FM Editor-in chief Michael Heisler, FM Editor Jessie Lilley, Basil Gogos, and Cortlandt Hull were among the panel members. Phil Kim then shared the next cover for FM (#252) and the cover for FM #70 for the “retro FM” series that will be published in the near future. Phil touched on the fact that Forry would have wanted FM to evolve and include modern day directors, producers and movies alongside the silver screen horror articles that graced the pages of the original FM. Bela G. Lugosi and Kevin Burns in front of the Witch's Dungeon exhibit. This image comes from the Witch's Dungeon's photoset on Facebook. Afterwards I spent more time perusing the dealers' room and noticed a lot of people talking about Forry and their Famous Monsters magazine collections. A friend of mine completed his FM Collection by purchasing Issue #3 and #4 from the largest magazine dealer at the Con, Michael Pierce and Monsters Among Us. Per a pre-arrangement I had one last stop to make for the day. Earlier I had spoken to Bela Lugosi Jr. and showed him a rare Spanish biography of his father. He signed my copy and was interested in acquiring one for himself. His daughter Lynne also seemed surprised and interested in the book as she had not seen it before. I was able to present them with my extra copy of the book and two super cool Crestwood House Book Monster Series posters that feature Lugosi as Dracula. They signed my copy of the poster and had not seen this collectible before. Bela Jr. then signed many of my Lugosi biography books as a favor to me. This was obviously one of the highlights of the con. Bela Jr. was soon whisked away to the VIP party and I called it a night. What a wonderful memory! Sunday at the Con was another fangtastic day filled with spending time with friends. I was fortunate to catch my friend Eric Grayson’s TV pilot Dr. Film which included many vintage rare interviews with Bela Lugosi. 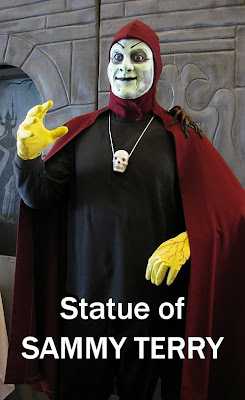 I also chatted with local horror host Sammy Terry’s son about his father’s career, and signed the petition to get a permanent display in the Indiana State Museum in honor of the Hoosier Horror Host. Last but not least I spent the afternoon chatting with some Universal Monster Army members and the founders of the Horror Society from Illinois. Afterwards I had dinner with the Severed Drunken Head himself: Max Cheney and Jane Considine. We shared convention stories and reminisced about the Ackermonster. Max himself did not appear intoxicated as coffee was his beverage of choice and his head was firmly attached to his body. Overall I really enjoyed FM Con 2010. It was a huge success as it was well attended and everyone seemed to be having a good time! Kong-sized Kudos to Phil and his FM staff and volunteers for putting on such a great show. I am already looking forry-ward to Revenge of the Indy FM Con next year! ...is an original pencil sketch done for me by the artist Brett Douglas Davis. I asked for something that combined humor and horror and was not entirely abstract. Davis was recognized last year in the magazine New American Paintings ("Juried Exhibitions-in-Print") as a rising young American talent. My favorite pieces in his body of art are the portraits or figural pieces that employ distortion to disorient the viewer, and suggest a fascination with the shaping of identity by changes to the body. This drawing uses a minimal amount of distortion, and is mainly there for a comic effect. Brett knew me well enough to know what a high price I put on cheap humor. I wonder if fellow Pittsburgher Kyra Schoen of the original Night of the Living Dead (the "zombie girl") would smile if I she saw this? Summer Convention Wrap-Up: The 2010 FM Con! More story and photos coming on this at this very blog! I've been waiting to let you all in on something I'm e-normously happy about. 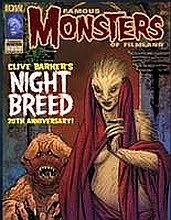 Just after posting about the sad news of the death of actress Patricia Neal, I see that I am now appearing at the website for FAMOUS MONSTERS OF FILMLAND. Just now posted by the administrator of the site is The Monstrous Art of Frank Dietz, written by ye olde blogmeister, me. I'd been asked to contribute to the site by owner Phil Kim, and was supremely honored (and scared silly, frankly) to contribute to the most famous brand in in the history of horror fandom. More reports and pictures from fans and yours truly on the FAMOUS MONSTERS Convention held earlier this summer! Robots I have known and loved-- and grown suspicious of! Macabre art by artist Brett Douglas Davis! A contest to win free stuff from FAMOUS MONSTERS! This blog hasn't been very active for the past month, for a number of reasons, including illness, blues in the night, extra work, and a-sundry causes for lamentation. Keeping the smile on this severed head has sometimes been a struggle of late, with the largest stress coming from knowing a family member is facing the need for hospice, and a friend is struggling with cancer. So my thoughts have turned at times to the reaper with the scythe that harvests all souls. And on the same day that I read a moving, eloquent essay by Christopher Hitchens on his confronting his esophageal cancer, I read that actress Patricia Neal has died, and I'm just a bit sadder still. 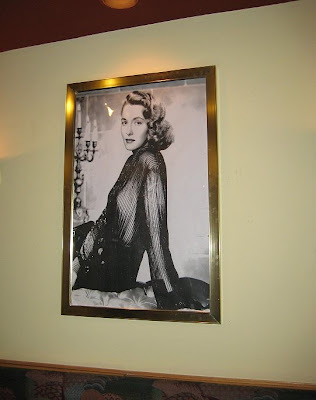 The Voodoo Queen and I had the honor and pleasure of seeing Patricia Neal up close two years ago at a screening of the classic film The Day the Earth Stood Still. She spoke of her love of acting, of Gary Cooper, and of life itself, despite some famous, hard setbacks, such as the three strokes that hit her at age 39. She fought the effects from them fight with for years, never completely overcoming them. But she adapted, making a far better recovery than was thought possible and going on to distinguish herself with acclaimed performances in film and television. Read the TDSH post about Ms. Neal's appearance at the 2008 Annual 24 Hour Sci-Fi Marathon here. 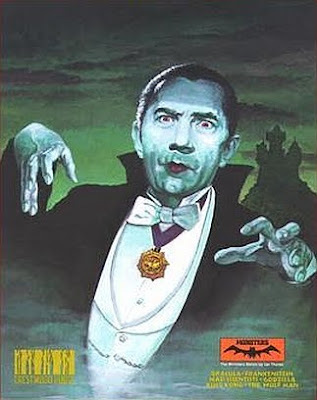 In an earlier post, I shared hotel security video of a man stealing the Famous Monsters Convention banner with a Dracula portrait by noted artist Basil Gogos. But the story has a happy ending-- the man has turned in the banner! He was nagged into it by his teenage daughter, who saw the video elsewhere on the Net and was, like, TOTALLY EMBARRASSED! It's been reported no charges will be filed. A few years sentence of being around his mortified kid seems to be enough punishment for the guy!